Cattail is highly desired filler highly desired for weddings and church arrangements because of its flowering spike. The leaves can reach up to 3 to 10 feet. It is available from July to November. They need to have “wet feet” during growing season; this is why the availability is a narrow window of opportunity. Flowers have always symbolized something significant and have been elements of beauty. Wherever put to use, flowers add to the charm of the place and create a vibrant atmosphere around them. Why always settle for mainstream flowers for arrangements and décor when you have other things of beauty that are not so common? As rare as it sounds, a cattail flower is one of the most beautiful and significant species when it comes to plant family. Also known as ‘Typha,' the tall beauty is symbolic for peace and love. This unique flower is generally used for feuding pals or lovers. 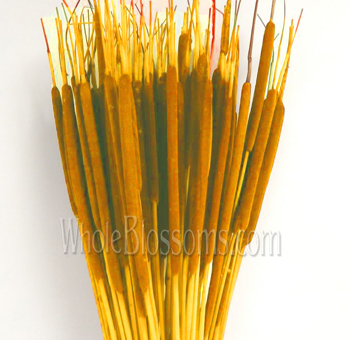 The cattail flower also stands as the symbol of prosperity and well-wishes too. So, whenever it comes to settling a long-standing dispute or to invite peace and love in your life, opt for these beauties! These tall blooms are also put to great use when it comes to having beautiful outdoor flower arrangements for special occasions. Being of a not so common appearance, these blooms aren’t available everywhere very easily either. However, there are special cattail florists, aware of the perfect conditions and climate that these flowers require to bloom in their best looks and strength. These florists create ideal conditions for the cattail flowers to thrive in their gardens. These flowers are well-suited for wetlands as well as the wild lands and marshy areas. The florists who own wetland farms generally grow these elements of beauty. Though the flowers carry a beauty unmatched, they are quite simple in appearance. It is this simplicity that makes them look elegant and gives the place a subtle feel. The central flower part is relatively long, about a foot long. This part is supported by a sturdy, thick stem which is about an inch and a half in diameter. The brown cattail flowers are available most commonly. However, other colors like black and white are also available in these blooms. The leaves of these flowers are tall and spiky too. Owning a habitat in the wild, these blooms have sharp leaf edges. The leaves and stems carry a perfect shade of green adding to the beauty and wilderness feel of the cattail flowers. Just because these beautiful tall flowers are not very easy to grow, doesn’t mean you can’t have them for your flower arrangements! All you need to do is find the right place to buy your flowers. Whole Blossoms is the perfect place for purchasing flowers for wedding arrangements and other décor. They not only provide the best quality, but they also offer it at the best prices in the market! Being an online retailer, the customer gets all the perks. All the customers need to do is select the flowers of their choice and place an order of their desired quantity. Whole Blossoms will be at their service to deliver the flowers at the venue they like, whenever they want. Not just these cattails, but all the flowers too. Be it roses, lilies, chrysanthemums or the agapanthus; they have it all. Just click and you are set for the decorations. Never compromise on the quality and quantity when it comes to buying flowers for your special occasions' decorations. Choose online retailers like Whole Blossoms and have the perfect flowers on your occasion. Bring the richness and elegance to your decorations and arrangements with the use of perfect flowers. With all the fancy trends brewing up in the market, cattail flower arrangements are gaining popularity when it comes to flower décor. Having a tall and wild appearance, these blooms are best suited for outdoor affairs. Be it a daytime affair or an evening one, these look beautiful. You could put them to use in bouquets or as table centerpieces for the venue. Many tropical themed weddings employ these flowers for the decorations.They can also be potted along the wedding aisle or altar to give a unique appearance. If it is an evening occasion, you could opt for placing these along the perimeters of the venue area along with candles or fairy lights to complete the look of the venue. Having a unique flower décor for your special occasion will make your eventextraordinary. Combine these mesmerizing cattail flowers with the perfect greens to enhance their appearance. Combining these with smaller, bright colored flowers will add to their beauty, complementing it perfectly. 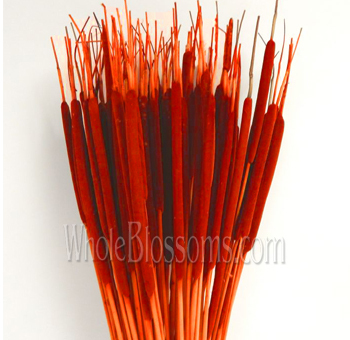 You could also pair these cattails up with flowers having a distinct, pleasant aroma to complete the décor. 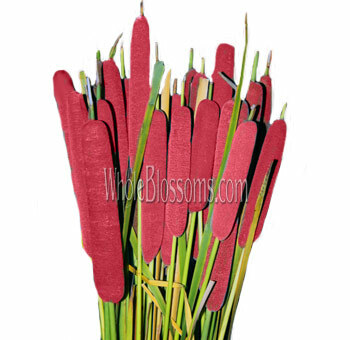 Add these cattail flowers to decorate and enhance the ambiance of your special occasion. Give your venue a luxurious and classy feel with these tall beauties and make the event memorable.